Turkey’s foreign minister on Wednesday said Turkey will take first delivery of the Russian S-400 missile system by late 2019. "The first batteries will be delivered towards the end of the next year,” Mevlüt Çavuşoğlu told reporters in Brussels, where he is attending a NATO meeting. 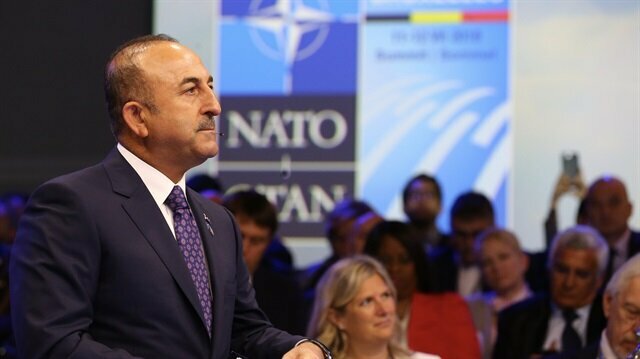 Çavuşoğlu said that besides the U.S., some other NATO member states have also questioned the purchase, but that this must end. President Recep Tayyip Erdoğan will attend his first major international summit since getting reelected on Wednesday when he attends the NATO heads of state and government meeting in Brussels.The NATO meeting will take place for the first time at the new alliance headquarters.Video: Anti-Trump protest in BrusselsAt the meeting, Erdoğan will meet and hold bilateral meetings with a number of world leaders, including American President Donal Trump, French President Emmanuel Macron and British Prime Minister Theresa May.It is expected that Erdoğan and other leaders will discuss the support YPG/PKK terror group receives from some NATO member countries and the S-400 missile system that Turkey is getting from Russia.People of Manbij long for Turkey's interventionErdoğan is also expected to meet European Council head Donald Tusk, European Commission President Jean-Claude Juncker and European Parliament President Antonio Tajani.First Lady Emine Erdoğan is expected to accompany her husband during the visit to Brussels. "We can understand the technical part. For example, it is normal for them to ask whether the S-400 recognizes NATO, NATO systems or allies as an enemy. We are also sensitive to this issue,” he said. “We have already laid down our conditions in this regard while making the purchase,” he added. Strict U.S. export controls may have led Turkey to purchase Russia’s S-400 air defense system, Airforce Secretary Heather Wilson suggested Tuesday.Asked if Turkey’s deal to buy missile defense systems from Russia is causing problems with NATO, Wilson said: “I don’t connect those problems directly with the NATO alliance.”Instead, she suggested that America’s strict export controls could be behind Ankara’s decision to purchase from Russia.She said America’s strict export policy could be causing issues with its allies. For example, the U.S. will not sell unmanned aerial vehicles due to export controls, so its allies are forced to purchase them from China, which “creates a problem”.Wilson said the U.S. “needs to figure out how to be better allies”, such as by “building things that are designed to be exportable from the very beginning so that we can all operate out of the same equipment rather than create problems”.Wilson said Turkey’s purchase presents some operational problems which the departments of state and defense are discussing with Ankara.“Particularly as it relates to the location of advanced aircraft in Turkey…like the F-35,” she said.The U.S. is expected to begin delivery of F-35 fighters to Turkey later this year, with the first shipment slated for June 21.US denies reaching agreement with Turkey on Manbij“We would not want to have that aircraft close to the S-400. And so those discussions are going on with Turkey. And we are hopeful that that can be resolved before they would take delivery of that aircraft into Turkey itself.Last December, Turkey announced it had concluded an agreement with Russia for the purchase of two S-400 systems by early 2020.In 2014, Turkey placed an order for the first two F-35 jets for a projected fleet of 100 F-35A aircraft and plans to deploy the aircraft by 2019. “If our NATO allies were to meet these needs of ours, we would take from them; we gave them priority,” he said.